There was a good round-up of 14 new guidebooks for New England in this morning’s Boston Globe. Two in particular caught my forest-loving attention. A new companion guide to one of my all-time favorite books about the New England landscape. 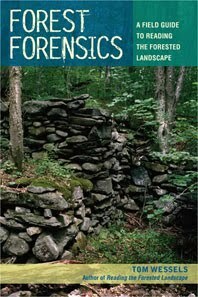 In Wessels’ landmark book, Reading the Forested Landscape, he provides an exceptional overview for interpreting the history of a given forested area based on clues in the landscape, including stone walls, tree types and ages, animal activity, and more. Beautiful woodcuts illustrate the key points in each chapter. If I had to recommend only three books about New England’s natural history, this would definitely be one of them. In his new book, according to the press copy, “Wessels has created a key—a fascinating series of either/or questions—to guide you through the process of analyzing what you see. You’ll feel like a woodland Sherlock Holmes.” Can’t wait to get my hands on this one. 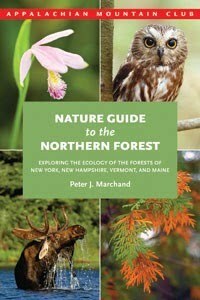 A much enhanced version of Marchand’s 1987 book, North Woods, this new guide explores the natural history of the Northern Forest, which encompasses the majority of Vermont, New Hampshire, Maine, and upstate New York. Full-color photographs illustrate key plants and animals in the region, making it easy for readers to identify them in the field. If you backpack in New England, you almost certainly spend time in the Northern Forest. This book will enhance your backcountry experience all the more.